Ok, here it is! My first quilt-along! 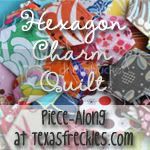 Let's make hexagon charm quilts! A charm quilt is a quilt in which no two fabrics are alike. (Read more about charm quilts here.) I'm not going to be working on a strict timeline, but we can keep each other motivated by sharing our progress and I'll offer hexagon tips and helpful links I find along the way. 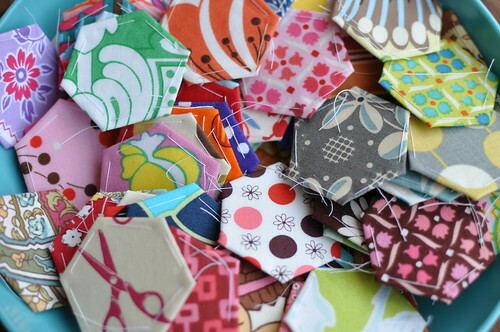 I've started a flickr group for the Hexagon Charm Quilt Piece-Along. Join and start sharing your photos! It's also a place where we can organize scrap swaps and discuss our hexagon addictions. Grab a piece-along button over there --> in the sidebar for your blog. Get someone else addicted! I'm making a throw sized quilt with one inch hexagons. For a 50 x 60" throw, I'll need 1,173 hexagons. How many hexagons will you need to make your throw sized quilt? Check below. I'm a designer by day, so I've made a couple of download pages that you might find helpful. Clicking on the images below will immediately begin the download from mediafire.com Google Groups. If you have trouble with the link or download, please let me know. This is a sheet of "Easy Cut" one inch hexagons. I had been using the hexagon generator, but I found it cumbersome to cut out the nested hexagons. 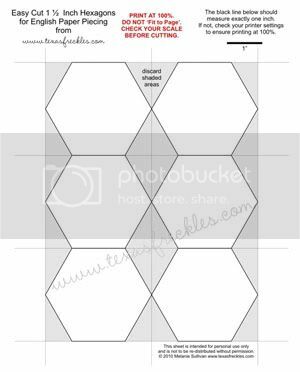 Using this sheet you can quickly cut your hexagons out in squares and then just snip off the corners. snipping the corners will go even faster! The page above is for 1.5" hexagons. (Just click to download it.) 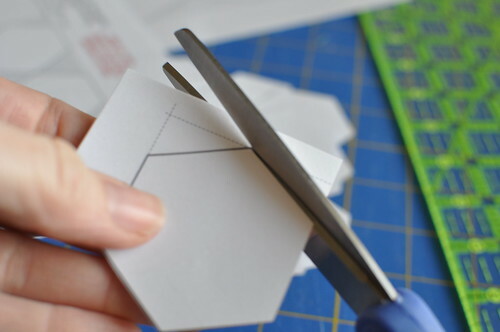 With hexagons larger than 1.5", only a couple fit on a page, so it's easy to cut them out; just use the hexagon generator. With both sheets, ensure that your printer is set to print at 100% and check your scale before you cut ! You don't want to make some strange sized hexies, do you? 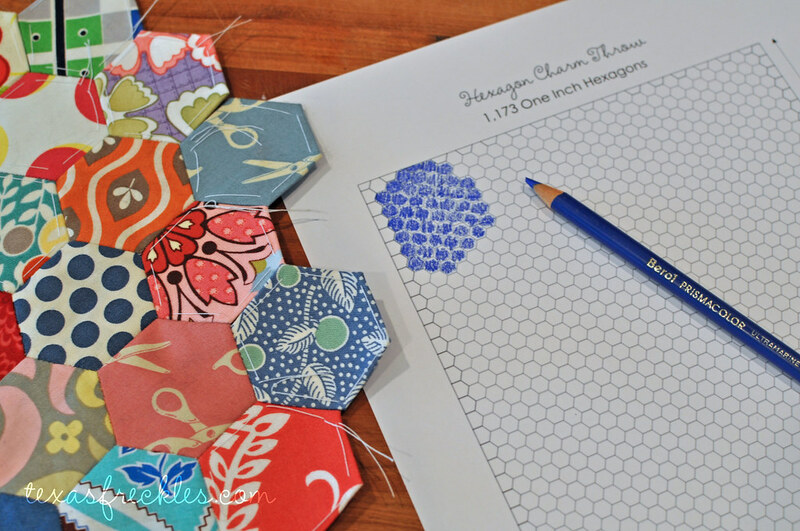 Haven't made hexagons yet? I complied some helpful links in this post. Just for fun, I made some coloring pages. Print one out for the quilt you want to make and visually keep up with your progress. Hummmm... I seem to have a long way to go. Lastly, I have one other request. This is my first quilt-along, so please be gentle with me. I've checked these numbers and downloads over and over to make sure that there are no mistakes, but alas, I'm human and it's very possible I've overlooked something. If you see anything that looks strange, please let me know and I will do my best to get it corrected as soon as possible. My email address is at the top of my sidebar. Whew! I'm tired and I haven't made a single hexagon today! I'll be back later with a little giveaway to get someone started and some hexagon basics! Just the movitation I need! Yhea! I made about 40 of these little hex's this weekend. Thanks for getting me addicted! Count me in! I was just getting a bag of stuff ready to make these on my vacation next week! thanks!! I am definitely joining this one. You inspired me to start making hexagons 3 days ago, and i am completely addicted. The only thing is, I am making a flower garden hexagon quilt. I was thinking no two flowers would be the same. Do you mind if i join anyway? Yay, count me in! I'll probably be working on this for aaaages, but it'll be nice to have others to compare notes with. Ok - I just stopped by and read this post - hmmm - NOW I have to try out and make some hexas ... this looks soo good and you described it really clear! thank you for your help!! !Without your help and download pages, it would be more difficult for me! I just begin with my charm patch and i found here exactely what I needed! Well since I already caught the Hexagon bug...count me in! Great idea for the coloring sheet, thanks! I know I'm thinking about it a little late... but can I join in? Haven't started anything. And thinking of going TINY. My heart id going peter patter with excitement! I am already making 3 project involving 1" hexies and wow! i had been wondering if I should be wise and save one of each colour for a charm quilt... BIG GRIN!!! I noticed your quiltalong while visiting you for BQF and well here I am, all the way from Cyprus! I'm in...just the kick in the pants I need. I started one last year and stopped. I didn't know I would need over 500 hexies!!!! Simply love the way you are doing this. I will try to post about what I have so far by this Friday. It seems the world's gone Hexy-mad! Everywhere I look another pops up. I made my furst hexy two days ago, rapidly followed by another six! Thanks for the links, I'm off to read up! Hi! Can I join? Even though my project has started out as a millenium quilt (2000 2.5" squares from a swap) to a Grandmother's Flower Garden to being put down for years until I found this site and you guys!? You can see what I have done up to now. I did not mention you yet but can always go back and edit! Hi, I am here via Karen. I have joined her one wednesday group and was wondering if it wasn't to late to join this group. I started a hexie charm quilt several years ago and have brought it out to work on it again. I have maked 2000 hexagonnes of 1 inch and now i'm bizzy with putting them togheter.A very hard job LOL. This timing is perfect! I have just gotten addicted to teeny hexies - yay! I'm in for the hints and motivation! Thanks! Hi, Melanie! I know I'm posting this way after the fact, but thank you so much for all of this great information. I am completely enamored with hexagons, but didn't know where to begin, and I've never really done any handsewing. I'm going to take the leap, all thanks to you! Thank you so much for posting this information. I've been seeing all these little hexies everywhere, and I've been VERY jealous! I can't wait to start on mine when I get home tonight. Finally, a use for all those charm packs I've been saving! I have just discovered your group and i hope that i am not too late to join you.I am working on a Grandmothers Flower Garden at the moment,but can't resist working with this as well,Hope you will say yes and let me feed my addiction please! Well, my Hexies were going to be a pin cushion...but you have inspired me to keep on going! Thank you for this! I just inherited a ton of scraps from my passed grandmother that go back to the 1930's and have been looking for a hexagon template for my charm quilt. I appreciate this post! I'm working on a 2" hexagon charm quilt. I started it about 2 months ago and have about 5 years to go! I do try to work on it every day, but it'll take time to finish it. It's beautiful. Thanks for the graph paper for coloring. Next time, I'll do that first. Thank you, thank you for the downloads. I used the 1" printables for making my first hexies today! You can read about it on my blog and I had to share a link back to you...wonderful printouts! Love the downloads. I am working on my first hexagon quilt and love it. It wont be my first one. I am self taught and I have learned so much from the Quilting Board and downloads and blogs like yours. Thanks. In case anyone likes help with the hexagon, Creative Memories have 2 punches with 2 different sizes on them that work with material. I got the hint on the board, I bought the large on ebay. I cut the paper with the smaller hexagon and then cut the bigger hexagon with the material. Works great, and got a great price on Ebay. Best hex template yet. I've been trying not to get caught up in hex's yet, but I've just cut out 100 templates. Because they all line up, I found it is easier to cut the horizontal, then instead of cutting squares, cut straight along the diagonal next making each strip into 2 diamonds and 2 odd shapes, then it is easy to cut around the rest. I production lined it and just cut out 5 sheets very quickly. Melanie, any chance you could send me the link to the templates? It doesn't seem to be working. Thank you! i was so excited to find this and so wanted to print out the sheets but the link is broken so i am still looking for printable sheets to get started. I was trying to go to both of your hexagon paper patterns to decide which size I wanted to use, and neither pattern worked - wasnt able to open them. Please let me know how I can access them. thanks!! I tried to access both of your hexagon patterns to determine which size I wanted to make, but was unable to get them. Could you please let me knowhow Ican access them. thanks!! Excelente post! Estou fazendo uma colcha com hexagonos e foi muito bom seguir as suas informações. Muito obrigado! 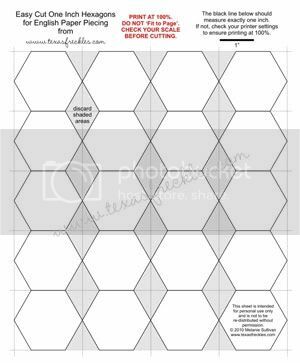 Do you still share your hexagon cutting sheets? I just found your wonderful set of posts as I plan to make a hexagon quilt of my own. Can you tell me how you figured out how many hexagons you'll be needing? In typically individual fashion, I want to do 1.25" hexagons, which you don't have on your list. My maths doesn't feel up to trying to figure out the formula myself right now. I'm loving your progress and am now following your blog. You can ignore my last comment. Thanks to letting google remind me of some basic geometry, I think I've worked it out. I just found your site and even though I'm (a little) late, I wanted to try the hexies since I've never done them. Any chance you still have the templates available somewhere else? Your post is so well written and clear! Thank you for your kind help! I was hoping that you would please let me know how I might get a copy of the hexagons? Eek! The download links aren't working & I lost my original I got from you before. One Inch Hex Starter Pack Giveaway!